So, here's a strange story. A couple of years ago we bought five full grown laying hens. As of right now we only have two of the original hens left. I noticed a while back that only one was laying, but since we weren't quite sure how old they really were I assumed that one was past it's prime. 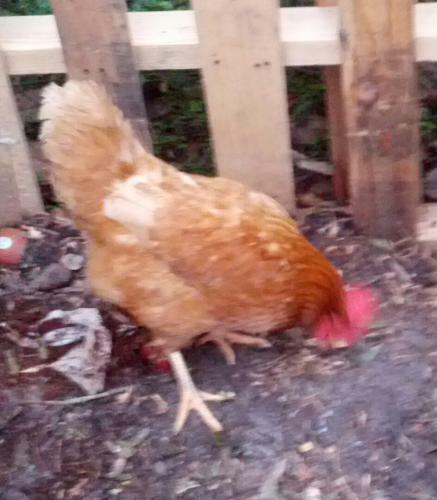 Then, about a month ago my neighbor asked me when I had gotten a rooster. I explained that I hadn't. The neighbor insisted that one of my chickens was on the fence crowing. The description matched the two original hens. I found them and, to my surprise, noticed that one was noticeably larger than the other. Also, she had spurs and her comb had gotten bigger. Bewildered, I started reading and what I found out shocked me. It seems that only one ovary developes in a chicken and this is what gives the female characteristics. If that ovary gets damaged somehow then the other one begins to develop. If it is what they call an ovotestis then it can actually cause the chicken to start taking on male characteristics. In effect, it becomes a he/she. So weird. I hate to get rid if her... um, him.. but he is starting to get aggressive with the other chickens. Who knew such a thing could happen? I never knew that EG, that's fascinating. Neither did I. Just as well we humans don't do that! !